It's hard to pass up Twin XL, Full, Queen, and King sheets that are so comfortable they make you want to say "Me Sooo Comfy", when you add them to your soft bedding. Our Me Sooo Comfy Sheets - Navy allow you to get the most comfortable bedding imaginable. 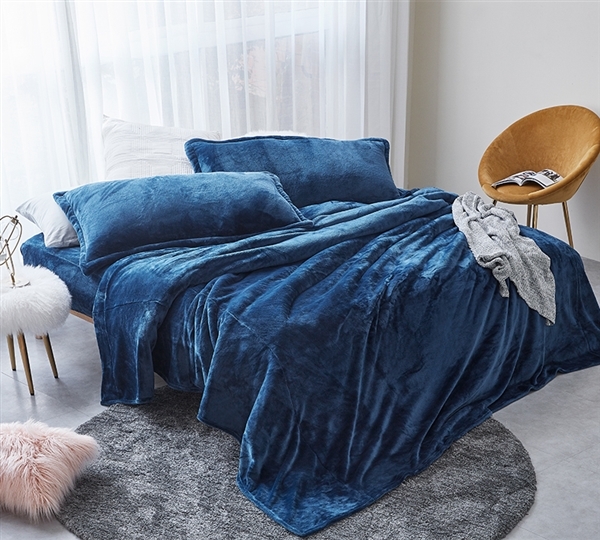 Made with an irresistibly cozy microfiber coral fleece, this sheet set will let you enjoy insanely soft comfort from head to toe. Complete with a true to size fitted sheet, an oversize flat sheet, and (1) or (2) matching pillow cases, this navy blue sheet set has everything you need to surround yourself in luxurious comfort. And not only do these must have Twin XL, Full, Queen, or King sheets have a fantastic feel, they will also make your bedding decor pop! These navy blue sheets will add beautiful color to your bedroom, upgrading your bedroom decor and creating a fantastic look all over. And these Twin XL, Full, Queen, and King sheet sets are comfortable to the point of just looking incredibly comfortable. And when your extra long Twin, Full, Full XL, Queen, and King bedding looks (and feels) this amazingly comfortable it will radiate comfort throughout your entire bedroom, giving it a cozy atmosphere that you may not want to leave. This comfortable ambience and the soft feeling of this essential sheet set will keep you oh so comfy on your Twin XL, Full, Full XL Queen, or King sized bed. Flat Sheet: 82" x 96" Comfort Proof Tested Results: 84" x 101"
(2) Pillowcase: 20" x 30"
Note: The intended manufactured dimensions of the Me Sooo Comfy Full Flat Sheet - Navy was 82" x 96". After being randomly selected, Comfort Proof Tested Results show the actual dimensions of the Me Sooo Comfy Full Flat Sheet - Navy is 84" x 101". Fitted Sheet: 54" x 80" x 14"
Flat Sheet: 90" x 104"
Fitted Sheet: 78" x 80" x 18"
Flat Sheet: 108" x 104"
(2) Pillowcase: 20" x 40"